Like sheep we line up at the movie theater concession stand to get our delicious popcorn for the reasonable price of $78.13, for a small bag. It's worth mortgaging our home because the flavor and the texture are so delicious, if not addicting. We dutifully buy popcorn in the theater because the popcorn propaganda is irresistible and because the movie theater man is watching. Don't even try to smuggle your own popcorn into the theater or else you might face the extreme shame that is...well, I'm not sure what happens because I've never been...uh, I mean I've never seen anyone get caught. But don't forget the guilt, the extreme guilt that accompanies the eeevil act of smuggling in one's own refreshments. No amount of cost savings is worth that kind of guilt, or is it? Smuggling regular microwave popcorn, for example, would not be worth the guilt. Sure you'll save money, but the flavor will not match the movie theater smell thus causing your brain to implode. But what if you were smuggling the same stuff that's in the the theater? Now you can. The secret recipe once known only to theater managers and their minions now belongs to the common man (and woman). Popcorn lovers unite! Popcorn power to the people! We will no longer yield to oppressive theater governments (unless caught)! Join the popcorn revolution, and learn how to make your very own delicious movie theater popcorn. Follow the directions below, and read on to become a popcorn expert. It's easy. It's economical. It's a blast! The coconut oil sizes are bulk (1 gallon), so do not be scared of the price. A 1 gallon bottle will last for many, many batches and is by far the most economical. Sometimes the coconut oil availability and pricing fluctuates on Amazon. It is important to check eBay for cheaper pricing just in case. Snappy is as good as Paragon. I put the links below so that you can always come back to this page and find coconut oil. On quick note about the popcorn. I buy it locally for as cheap as I can find it. If it is more convenient for you to buy popcorn on Amazon, I recommend the bulk popcorn sold by Paragon (which I've tried and is great) or Great Northern. B are oth highly rated. Secret: Odell's Super-Kist - Would you like "extra butter" with that? ...then you need to make an important decision: Which popper do you want? If you want brain-dead simplicity, yet amazing results, get the Nordic Ware microwave popper. If you want total control, larger capacity, the option to make kettle corn (yes, yes, yes! ), and an immersive popcorn experience, go for the Whirley-pop. Or, if you need it all, like me, do both! With all my heart, I want to impress upon the whole world that these are the only 2 kind of poppers you will ever need. You may feel tempted to buy other types of poppers (air poppers or theater style popcorn machines), but trust my experience when I say that you only need Whirley-Pop and Nordic Ware poppers. 2. Microwave on high until popping slows (same as microwavable bags of popcorn), about 2-3 minutes. Seriously, you're done and it's that easy! If you just want amazing movie theater popcorn quick and easy, you are done. But, if you want to learn techniques for the Whirley-pop and popcorn popping in general, read on! 4. Keep spinning until popping slows to one per second. 5. 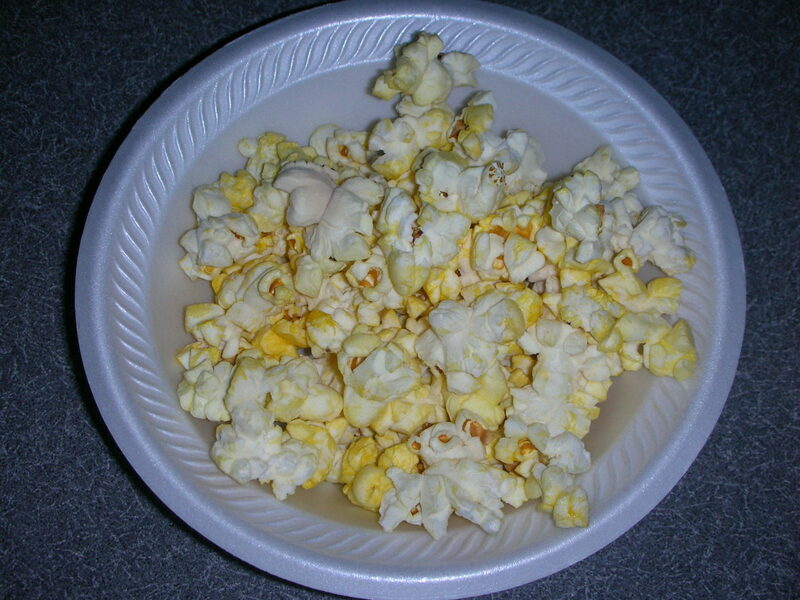 Remove the Whirley-Pop from stove burner, pour into bowl, and be amazed that you are eating real movie-theater popcorn. Step 2 is critical. You may be tempted to preheat your kettle or to use a higher burner setting. This may be detrimental to your popcorn, and much of this page is dedicated to explaining why. Perhaps this is the most money saving secret. When I started my popcorn journey, I thought that all I needed to do to make movie-theater-popcorn was to buy a movie-theater kettle popcorn machine. As I researched about popcorn machines, I quickly learned that by themselves they did not magically create movie-theater popcorn, and that many people were relying on kits or packets with all the ingredients mixed together to get the taste they wanted. When I learned that the ingredients were the important part, popcorn machines started to look much too expensive for my current needs. I was on the verge of buying a popcorn machine until suddenly I discovered the Whirley-Pop and realized that it offered the ability to control temperature (with some careful considerations) and a stirring mechanism similar to popcorn machines. - It is highly rated on Amazon by hundreds of customers. - Whirley-Pop has perfected the plastic gear system for the stirring mechanism. Don't be too concerned about the folks that say plastic gears are cheap and break too soon. I have read reviews on other stove top kettles with metal gears and there are as many complaints about the metal gears binding and breaking. I think that the plastic gears are so very smooth to operate. - The Whirley-Pop is a thin metal kettle. While some think this is bad and cheap, I love it because it means that the kettle heats up fast and cools down fast which is very convenient. - I have perfected my popping technique with Whirley-Pop, and if you buy one, you'll have this page as your guide. Many of us have been made to to think that somehow real butter has anything to do with movie-theater popcorn. Perhaps it is because when you get popcorn at the theater, they ask you if you would like "extra butter," as if there is already butter on the popcorn and they are simply going to add some more. Brainwashed by the movie-theater man, we will melt butter and pour it all over our popcorn, and love it, and that is perfectly fine because it really does taste great. However, real melted butter has nothing to do with the movie theater taste, except for the the word "butter". Another ding against butter is that it will make your popcorn soggy due to it's water content (butter contains about 15% water). Do you mean to say that oil does not make popcorn soggy? That is correct. WARNING: Never pop your popcorn in real-butter. The temperature at which butter burns (i.e. its smoke point of 250-300Â° F) is low enough that it will burn IF you are popping your popcorn at the correct temperature (460-480Â° F). The result can be terrible look, taste and smell. One interesting experiment that I would like to try is to pop popcorn in clarified butter (water and dairy stuff removed). This would work without burning because it has a smoke point of 485Â° F, but I don't know what the flavor would be like. Revision: It is possible to use real butter in your Whirley-pop, and have it taste good. I have a friend that did it and it shocked me. The color of the popcorn was brown, so it didn't look like butter, but it worked out. However, it still wasn't movie theater popcorn. I don't recommend it because butter is easy to burn. The first time I tasted my own popcorn made with the correct movie-theater popcorn ingredients, the clouds parted, a beam of light shone directly on me, and angels sang in perfect chorus. After that heavenly experience, paranoia set in. I knew that if I ever shared the secret, I would be a marked man. All movie theaters would black-list me and I wouldn't be surprised if this webpage mysteriously disappeared at anytime. But, I work for the people and together we can rise above the oppression of the movie theater man. While some may claim that "gourmet" popcorn is superior to regular popcorn, those who can make movie-theater popcorn just don't care. Just buy the cheap regular popcorn. I guarantee you that your local movie theater isn't thinking, "You know, since we charge $157.25 for a small bag, let's give our customers the best. Let's go gourmet." I suggest that while you are in your experimental stage, you buy the smallest bag of popcorn available to you. Later on, when you feel comfortable making a larger yet economical investment in popcorn, buy a 50lb bag of popcorn kernels at Sam's Club or Costco for about $25. A 50lb bag holds 200 1/2 cup batches (Whirley-Pop batches are 1/2 cups big) and I believe it will last you about 12-18 months. Fortunately popcorn will keep up to a year or more if stored in airtight containers. However, if you prefer to buy popcorn online you might try those listed below. I've tried the popcorn from Paragon, and it is great! Pop-Quiz: What color is butter flavored popcorn? If you have ever wondered why carrots are orange and what makes movie-theater popcorn yellow, now you know the answer: Beta Carotene. Perhaps there is one thing more important than how the popcorn smells, which is how it looks. Your popcorn can smell amazing, but if it doesn't look buttery, the illusion will fail. But why coconut oil? Half of what makes movie-theater popcorn taste like it does is because it is cooked in coconut oil. Some might disagree with this, but that is because they haven't done a side-by-side taste test with popcorn popped in vegetable, corn, or canola oil. You can pretend like your popcorn is great-tasting by cooking it in a "healthy" oil and doctoring it up with a fancy seasoning, but, coconut oil will haunt you in your dreams. A gallon of coconut oil will cost about $25, contains 96 Whirley-Pop batches, and will last you about 6 - 12 months. It is the most expensive ingredient, but it is so worth it. Don't worry if your coconut oil has solidified. It's supposed to do that when it is at or below 76° F.
Also, don't worry about the difference between Paragon and Snappy brands. The only difference is the price, and sometimes Paragon's jumps up too high! So don't forget to compare them and get promote competition. Don't worry about the poor reviews that say the oil has gone bad. Some folks don't understand how coconut oil behaves when cool vs hot. Amazon is a great place to find cheap coconut oil with beta carotene. When I first heard of Flavacol, I thought it was typo. Why would you name anything edible "something-COL?" The correct name would have been, "Magical Buttery Granules of Joy." Do not be fooled by any other butter-flavored powdered ingredient. If you need movie-theater taste, Flavacol is THE secret. In fact, I've recently noticed some movie theaters straying from the formula, resulting in bland popcorn. The reason for blandness is that they are NOT using FLAVACOL. Flavacol has the consistency of a very fine salt. It's fineness is what allows it to stick to the popcorn kernel wherever there is coconut oil. I known of one person that loves it so much, they will eat it plain! It is very potent, so be careful not to use to much. One carton of Flavacol is 2lbs, 3oz, contains 210 Whirley-Pop batches worth, and will last you about 12-18 months. It should be about $10-$12 on Amazon. Be careful not to buy the case of Flavacol unless you really want 12 cartons. One time I couldn't find just one carton for sale on Amazon, but Ebay had it. Every once in a while, it is required that you take something that is already so amazingly delicious, and make it even more delicious. While I personally don't add the extra "butter," it is important to me to know that I have the option. Please remember: Super-Kist is the icing on the cake. If you don't use coconut oil and Flavacol to pop your popcorn, you don't have the cake. So If you are an icing kind of person, put this in a kitchen spray bottle, and spray it onto your already perfect popcorn. I believe that a gallon will last between almost forever and forever, depending on how much you like to spray on your popcorn. Why Super-Kist instead of real butter? Many others have mentioned that they simply melt butter and drizzle it on top. The danger of using real butter is soggy popcorn due to butter's 15% water content, and that is why movie theater's don't use real butter. So if you you want what the movie theater uses, you now know what to do. - A temperature that is too high will result in a kernel that deceptively starts out fluffy and big on the outside, but as you bite all the way down, it turns into a ball-of-toughness that is impossible to chew and will not disintegrate. - A temperature that is too high will result in funny tasting/smelling popcorn as the coconut oil begins to burn (aka exceeding it's smoke point). - A temperature that is too low will result in an overly dried-out, too hard and crunchy result. - A temperature that is too low will decrease the amount of expansion of each popped kernel. - A temperature that is too low will increase the number unpopped kernels. Thanks to Wikipedia (http://en.wikipedia.org/wiki/Popcorn), we can learn that popcorn pops when the temperature inside the kernel reaches about 450° F. However, the correct temperature for your popcorn kettle will likely be higher than this. In a video made to market Whirley-Pop kettles, it is suggested that the kettle needs to be 465°. Alternatively, the picture of the Paragon Coconut Oil bottle above suggests that the proper temperature is 475°. I'm always experimenting with what is the best temperature, and I think it is slightly a moving target depending on the batch and age and water content of the kernels. It is my current belief that any temperature between 450° F and 475° F will work. I use texture to determine how to change my popping temperature. Your best temperature will be the one that gives you the texture you like best. I believe correct popping temperature is the most information on this page: If at some point you get a batch of popcorn that has any of the characteristics described above, do NOT wonder if it is the "quality" of your popcorn kernels, and, do NOT wonder if there is too much steam/water vapor in your kettle. FIRST wonder whether you are popping precisely within the 450° and 475° range. If you are absolutely sure that you are popping at the correct temperature, then perhaps it is possible that other factors such as kernel quality and water are affecting the result. - Seemingly perfect, dry, popcorn, outside and in. - Wonderfully expanded, looks absolutely perfect! - Very light and fluffy and crispy on the outside. - When one begins to bite down, it starts off so good, so crispy, so flavorful, BUT after biting down all the way, for some reason not yet understood by me, the popcorn turns into an indestructible ball of toughness that WILL NOT EVER disintegrate in you mouth. ...and you think it is just one popcorn kernel, so you pop another few in you mouth and guess what? More indestructible balls of toughness. They are so dense that I am certain that they last double the 7 years it takes chewing gum to pass through your stomach. I could easily test 1 and 2 by using other kinds of popcorn. I bought 5 different kinds of fresh kernels: Great Value (Walmart Brand), Paragon, Jolly Time, Act II, and Orville Redenbacher's Original Gourmet. Each type of popcorn came out chewy. I could not believe it. I realized at that point that either all of these were bad quality or stale, or, there was some other problem. 1. Do not let your popcorn sit too long in the popper after it has popped. 2. Make sure that the steam is allowed to escape from your popper during the popping process. 3. Make sure that your popper is preheated all the way by popping test kernels first. 4. Make the popping time as short as possible. 5. Make sure your popping temperature is not too low. I tested all of these tips. I made sure that as soon as the popping slowed even a little, that I poured the popcorn into a serving bowl. Didn't work. Even though the Whirley-Pop has vents for the steam, I tried opening the kettle lid once there was enough popcorn popped to block the popping seeds at the bottom. Didn't work. I tried the test kernel method to make sure that my kettle was hot enough before adding the rest of the kernels. Didn't work. I tried increasing the temperature to make the popping time as short as possible. Any guesses? Didn't work. After experimenting for several weeks, I almost gave up. I started thinking about buying a popcorn machine again. This got me thinking about how popcorn machines must have something that my Whirley-Pop doesn't. They both have kettles, stirring mechanisms and a way for the steam to escape. But what the Whirley-Pop doesn't have is a temperature control system. At the time I was thinking about this, I had also been using a popcorn machine at work that perfectly popped any brand/aged kernel I threw at it, including the same kernels I tested at home. The instructions for the popcorn machine at work said to warm up the kettle first, but I knew that I HAD warmed up my Whirley-Pop kettle first before adding popcorn and I still got chewy popcorn. I slowly concluded that I didn't know exactly how fast/slow and hot the popcorn machine kettle warmed up, nor how my stove burner warmed up, and that the difference between the two might reveal my problem. What temperature is too high? I'm not entirely sure what is too high, but I do know that a good range to stick to is 450° F to 475° F. To be specific, this would be the temperature taken at the the cooking surface that the kernel touches. This method has you put all of the ingredients into a cold popper BEFORE turning on the power/heat. Then after turning on the power/heat and waiting some time the temperature will eventually pass through the correct popping temperature range. The temperature does not stop rising, however, and it will continue to rise until it reaches some too-high limit built into the popper. The key and hope to this method is that the temperature rises slowly enough through the correct popping temperature range such that all of the popcorn will have popped before the temperature gets too hot. Which poppers usually use this method? How do you know for sure if the popper in question uses this method? You know it when the instructions tell you put all of the ingredients into a COLD popper, and then turn on the power/heat. I believe that most of the time this does work, BUT, it depends on each and every individual popping device. For example, what if the specific popper that you have limits the temperature to about 600° or above? I was shocked to learn that I had a popper that does this (a flip-over plug-in made by a well known brand). What I believe happens with this popper is that the temperature rises too quickly to 465°, which is great for speed, but then continues to rise quickly up to 600° and above. This means that most of the popcorn pops at a temperature that is too high. The result I got with this popper was beautifully expanded popcorn with zero unpopped kernels. However, the popped kernels were not edible because they turned into un-chewable death nuggets when biting down on them. Perhaps it is possible that only this particular unit had this flaw, and that every other unit made by this brand correctly limits the temperature to be much lower such that the temperature rises more slowly and the popcorn pops at the correct temperature. Verdict: The cold-start method in and of itself is not a bad way to pop popcorn. Millions have enjoyed popcorn using cold-start method/poppers. If you get a good popper that increases the temperature at a slow enough rate and limits the temperature so that it does not get too high too fast, then you will be very happy. Based on my poor experience with my local store bought flip-over popper, I have learned that when I buy any of these poppers, I have no control over the temperature. That means that I must put all of my trust into an economy popper to limit the temperature correctly. Furthermore, because the cold-start method relies on the temperature rising through a small temperature window, it seems like there is little room for error that might be caused by minor manufacturing variances. In other words, it's easy for the manufacturing quality to mess up the cold-start method. As a result, I'm hesitant to buy more poppers that use this method. This method has you first warm up the kettle for a few minutes (usually 3-5 minutes), and then AFTER the kettle is warmed-up to the correct temperature, add the ingredients. After the kettle warms up, the kettle temperature is controlled to hover around a correct popping temperature range. The beautiful thing about this method and the poppers that us it is that as long as the popcorn machine doesn't have any defects, it guards against popping at temperatures that are too high or too low, and can make your popping experience worry free. How do you know for sure if the popcorn machine in question uses this method? You know it when the instructions tell you to warm up the kettle for a few minutes before putting in all of the ingredients into a HOT kettle. Yes. The only time this method may not work is if the specific popcorn machine has a defect in the temperature control system. Barring defective popcorn machine kettles, I believe this method is the most reliable way to pop light and crispy popcorn every time. However, there is a price to be paid. You aren't just paying for the cool theater-looking popcorn machine and the ability to pop anywhere in your house. You are also paying for reliable temperature control. Verdict: I believe the pre-heat method gives the most consistent results. Interestingly enough, popcorn machines suffer from the same problem as the cold-start poppers above: You cannot control the temperature yourself. Millions upon millions of people have enjoyed popcorn from kettle popcorn machines, but if you happen to get the one out of a hundred poppers that has the temperature control set to hover below 450 F° degrees or above 480 F°, you will be very unhappy because you spent a lot of money. Despite this small risk, I personally would not let this stop me from purchasing a kettle popcorn machine (I'm still considering one as I write this). My belief, in this case, is that paying more money means that there is more quality control and that there is a good chance you will be very happy with your movie-theater kettle popcorn machine. I know I said that there are 2 methods, and that is true, but it is important to add this 3rd category. You may have noticed that the popper that I am most promoting on this page is missing from the 1st two categories: The stove top stirring popper. This popper is unique because by itself it does not have any temperature limit or control. It might be obvious, but I'll say it anyway: With a stove top popper, you have complete control over the temperature. That means that you can choose either of the methods above for popping. If you prefer the ease and speed of the cold-start method, put all of your ingredients into your Whirley-Pop first, and then turn your stove on to medium heat. This is how Whirley-pop instructions say to do it. However, if you are a control freak like me and prefer knowing that you are popping at exactly the best temperature, use the pre-heat method. To use the pre-heat method you must discover how far to turn your stove knob to get 460°-480° F and then let your Whirley-Pop warm up. Once it is warmed up, add the ingredients. I have more detailed instructions on how to do this further down this page. Do both of these methods work on the Whirley--Pop? Yes and yes. However, to be totally up-front, both methods can be error prone. Without a plugged-in popper to do any temperature control for us, we are our own worst enemy. As a result, patience may be needed to perfect your temperature control technique. The very good news is that with total control over temperature, and with enough patience, it is guaranteed that at some point you will be able to pop your popcorn at the temperature that give you the popcorn texture you want. Other popping devices do not offer this flexibility, and that is what makes the Whirley-Pop such an attractive option. Verdict: I would definitely buy the Whirley-Pop. Because it is one of the cheapest options, you have little to lose except perhaps the time that you are having fun experimenting with different popping methods. Because it offers complete control over temperature, you will ultimately get great results, and most folks get them immediately by simply following Whirley-Pop's cold-start instructions (one only needs look at the Whirley-Pop reviews on Amazon to see how many are happy with the results). However, if you are not interested in popcorn experimentation, or amazingly delicious popcorn, I recommend you stick with microwavable bagged popcorn. After I had been struggling to control the temperature of my Whirley-Pop on my stove for many weeks, I happened across a flip-over oil popper that also had an automatic stirring mechanism, made by a well known brand. I was so excited thinking that it would do all of the work of controlling a nice constant temperature around 460-480°. I followed the instructions by loading all the ingredients, plugging it in, and waiting for the popping to finish. But guess what? CHEWY popcorn. I could not believe it. I could not find any escape out of my chewy popcorn purgatory. By this time, I had purchased an infrared thermometer (love it!) and I was ready to measure the temperature of the black heated base after the popcorn was done. At the point in time that all the popcorn finished popping, the temperature of the base was OVER 600° F. I could not believe it. I thought about returning the popper, but then thought how insane I would appear to the store clerk if I were to I say, "Did you know this popper's temperature is too high! Over 600°! I realize that the problem could have been only with my popper. Perhaps the rest of the poppers of this model stop at a more reasonable max temperature. The maker of the unit might say that the problem was that I didn't have good enough popcorn that would pop at a low enough temperature (aka gourmet) and so it took longer (i.e. higher temperature) for my popcorn to pop than it should. There might be some truth to this, but, I don't care because I pop the same popcorn perfectly in my Whirley-Pop now. With the number of times I have seen this advice written on the internet, I would think that this is absolute fact. On the surface it makes a lot of sense. I don't want to put all of my popcorn in the popper until it is hot enough (for whatever reason), so throw in the oil and a few test kernels and when they pop I'm good to go and put in all the rest. MAYBE! The test kernel method should only be used when your popper/kettle uses the Pre-heat method. The Pre-heat method constantly controls the temperature to stay at the correct popping temperature. When you throw in a test kernel in a Pre-heat method popper, the kernel will pop when the temperature has reached the correct temperature. From then on the temperature STAYS at the correct temperature and you really are good to go. This feature is what makes more expensive popcorn machines so appealing to me because there is no worrying if the temperature is correct. Unfortunately, the kernel test method does NOT work for poppers that use the Cold-start method. The Cold-start method increases the temperature past the correct popping temperature range until some higher temperature limit is reached. Remember that most stand-alone poppers use the Cold-start method. In fact, the instructions for many of these these poppers explicitly state to not preheat the popper before adding the kernels. The reason the kernel test method does not work for these poppers is because after the test kernel pops, the temperature of the popper still continues to rise to some higher temperature that is too hot, resulting in tough-to-chew popcorn. BUT, you may ask, what about stove top poppers that do not control the temperature by themselves? Very, very good question. It depends. If you follow the Whirley-Pop instructions and simply set the the burner knob to medium (to medium-high) heat, do NOT use the kernel test method. The reason is because Whirley-Pop is instructing you to use the Cold-start method. You (and Whirley-Pop for that matter) do not have a clue what temperature your burner will ultimately reach at medium to medium-high heat. They are counting on the fact that if you have put all of your kernels in your kettle before turning on the burner, the popcorn will heat up and pop once the kettle reaches just above 450° F and be mostly popped before the burner and kettle reach who knows what temperature. If you were to set your burner to any significant setting, throw in a test kernel and wait for it to pop, by the time you put in the rest of your kernels, the kettle temperature will have increased far past the correct temperature for popping corn, and you will likely get tough-to-chew popcorn. Now, just because Whirley-Pop instructs you to set your burner to medium/medium high heat (aka shooting from the hip), it doesn't mean you have to. If you know the exact setting on your burner knob that gives you 460-480°, then you can use the kernel test method with confidence knowing that your kettle temperature will not go up after your test kernel pops. If you have read this far (congratulations, you are as mental as I am), you might be asking, how the heck do I find out exactly where to turn my stove knob to get a burner temperature around 470° F? Keep on reading. When I finally came to the conclusion that popping at a correct temperature is critical, I started to get serious. I wanted to know with absolute certainty how hot my stove burner was, so that I could dial in the exact setting on my knob to give me 460-480°. I didn't even know that infrared thermometers existed, but a google search for measuring pan temperature took care of that. See below for a link to the thermometer that I bought on Amazon. After my infrared thermometer arrived, I excitedly started experimenting and pointing it inside my Whirley-Pop as my stove burner heated up. I'm a little dense sometimes and even though I read the warning in the thermometer instructions, it took me a couple of days to figure out that the thermometer does NOT work when you point it at a shiny reflective surface. That meant that I could not point it at my Whirley-Pop because it's made out of shiny metal. But I got smart. I pulled out one of my Teflon coated skillets and measured it while my stove burner heated up. I was able to find the "exact" knob setting that corresponded to a steady state range of temperatures between 460-480°. True, the skillet has different heat dissipation characteristics than the Whirley-Pop, but it got me close enough. See the steps to do this in the next section for how I did this. If like me you are interested in knowing what temperature your Whirley-Pop is, you must buy an infrared thermometer. The one I bought is listed below and although some of the stickers are falling off, it works great. It has a laser pointer to show you where you are measuring, comes with a battery, and displays in Fahrenheit and Celsius. It is a requirement if you like to cook and want to be able to preheat pans to precise temperatures. It also comes in handy if you need to measure temperatures of your house wall several feet away. ...And it's cheap (around $20) compared to all the rest (I know, I'm a sell out). But, it is also very highly rated! Please remember that an infrared thermometer can't read the temperature of a highly reflective surface (such as the Whirley-Pop). That is why I use a Teflon coated skillet to make all of my measurement, and this seems to work well. 1. When I turn on my burner to any setting, it takes a very long time (around 7-10 minutes on my stove, for the temperature of the pan to level off. In other words, the pan doesn't reach it's final temperature quickly, and much patience is needed to determine which knob setting corresponds to which pan temperature. The long heat-up time is likely due to my stove being a flat-top stove. My guess is that a normal electric stove with the usual exposed heating element will heat the pan up a little faster. Also a gas stove should heat a pan up much faster. 3. Very small movements in your stove's burner control knob can translate to large differences in the final leveled-off burner temperature. For example, when I learned to wait long enough for the pan temperature to level off after choosing a knob setting, I was shocked to learn that a knob setting of just over 3 (my knob has numbers from 0 to 9) resulted in a final temperature of 460-480°! But I believe we have all experienced this while frying several eggs or pancakes one at a time for several minutes. We want to cook right away so we wait a minute (not nearly long enough) for the pan to heat up at medium heat. Then after the 1st or 2nd batch (3-5 more minutes), we notice that the temperature is way too hot and our eggs and pancakes overcook, and we have to adjust the knob to a lower setting. 4. The burner is not the same temperature at all places on the element, and thus the bottom of the pan does not heat up evenly. For example, when I reach my preferred temperature, 12 o'clock on the pan is about 480°, 3 and 9 o'clock are at 470°, 6 o'clock is at 460°, and the center of the pan is often around 500°. (Note that although 500° is getting too hot, the kernels in the Whirley-Pop are mostly only touching the outside parts of the pan bottom due to the effects of the stirring mechanism and the shape of the popper base. That is why it is OK for the center of the pan base to be hotter than the outside area. 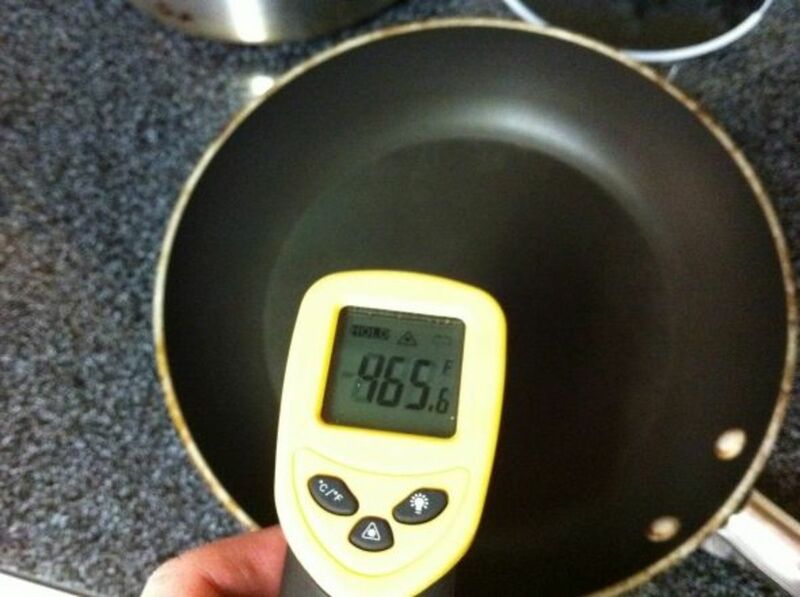 Note: When measuring the temperature, always choose 4 spots on the outside parts of the bottom of the pan to measure. I suggest measuring the 12, 3, 6, and 9 o'clock positions. Be precise about where you measure each time so that you can tell for sure if the temperature is rising or not. 1. Buy an infrared thermometer. 2. Find a skillet that has the same radius as the Whirley-Pop and that has a dark non-reflective coating like Teflon. 4. If the temperature is too low, dial the knob to the next full number up, and wait. 5. If the temperature is too high, dial the knob to the next full number down, and wait. 6. If the temperature is too high, dial in the next half number down (i.e. go to 3.5 if your were at 4) and wait. 7. If the temperature is too low, dial in the next half number up (i.e. go to 1.5 if your were at 1) and wait. Repeat 6 or 7 until you have skipped over the temperature you want. 8. If the temperature is too low, dial in the next 1/4 number up (i.e. 1.75 if your were at 1.5) and wait. 9. If the temperature is too high, dial in the next 1/4 number down (i.e. 3.25 if your were at 3.5) and wait. By this time you are getting very close, but perfection is important. Use the same adjust and wait method to and turn the knob up or down in 1/8 increments, or even smaller increments until you get the temperature you want. It may sound silly to turn the knob from 3 and 1/16 to 3 and 2/16 (see the picture above), but that is what took me from about 455° to about 470°. When you finally dial in the correct temperature, find a way to mark it! I suggest using transparent tape as I did in the picture above (look closely, it is a little fuzzy). I placed the tape such that one of the corners points to the exact place I need to turn the knob. We're close now, but not done yet because now we need to check our work. Turn off your stove and let it cool down. Leaving your dark surfaced skillet on, Turn the stove to exactly where you placed your marker, and wait 7-10 minutes. See if the temperature is the same as what you expected. Be patient. If you discover that the temperature is not quite what you wanted then try to get to your perfect temperature with very small adjustments to the knob setting. After you have found the correct knob setting for sure you never have to go through this process again. You simply turn your knob to your tape corner, wait 7-10 minutes and add your ingredients. Please keep in mind that 7-10 minutes pre-heat time is specific to my stove. If you have a gas stove, I expect your preheat time to be much shorter. Also, your electric stove may be much faster than mine. As you may have gathered, this can be a lengthy and tedious process, but for me it was worth it just knowing that I will always have the perfect popping temperature every time. After you've read all of the stuff above, you might think that the Pre-heat method is overkill for getting the perfect popcorn...and you are probably right. The reason you are probably right is because thousands, if not millions of people just follow the simple instructions provided by Whirley-Pop, and are happy with the results (as can be seen by reading Amazon reviews). Whirley-Pop instructions use the Cold-start method. They instruct to NOT turn on the stove, then add the ingredients, then turn on the stove to medium to medium-high heat. If this approach works for you and you feel confident that you are getting perfect results every time, then I'm jealous and wish I had your karma. I started off using the Cold-start method, and had a tough time figuring out why I got tough-to-chew popcorn. That said, after I went through all of my tough-to-chew popcorn life trials, what I ultimately learned with my infrared thermometer was that I was turning my burner knob setting much too high, even though I set it to what Whirley-Pop recommended, which was medium heat. Allow me re-iterate: above medium heat is too high on my stove when using the cold-start method. When I finally trusted that just below medium heat was not too low a setting for popping popcorn, I tried the Cold-start method using or just below it medium heat, and the results were fine. I hope you can benefit from my experience, and perhaps avoid having to invest money and time into an infrared thermometer if the Pre-heat method is not for you. 1. For your very first pops with the Whirley-Pop, do not set your burner knob to anything above exact medium heat. Especially do not go up to "medium-high" as Whirley-Pop sort of suggests. 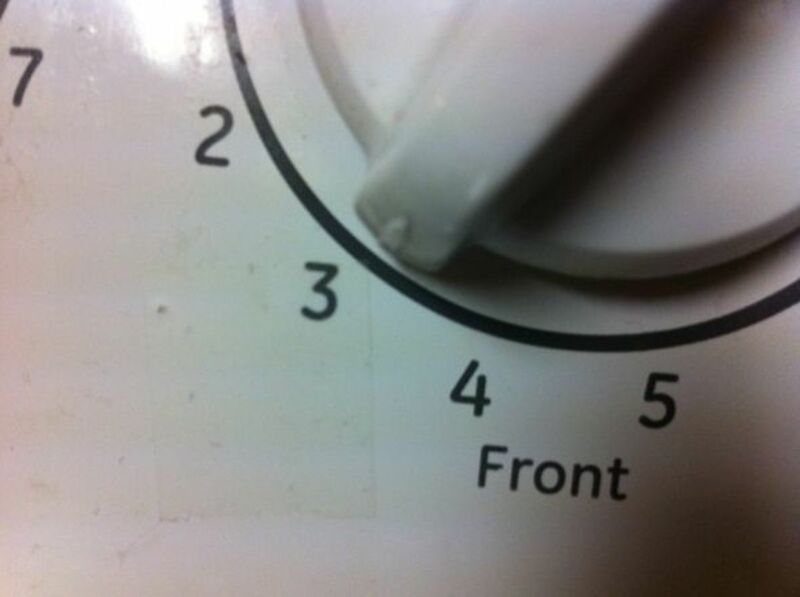 If your knob has numbers from 1 to 10, start on 5. Do not try higher settings unless you know for sure that medium heat on your stove is too low. 2 Always make note of the temperature to which you set your burner knob. When you decide you've found the setting that results in perfect popcorn texture, you'll want to always set your burner knob to this EXACT setting. EXACTNESS is important to get consistent results. I suggest using the corner of clear adhesive tape to mark the perfect spot for you once you have found it. 3. If your popcorn comes out very expanded, with all kernels popped, but, tough to chew, then your knob setting was too high. Next time you pop, adjust your knob setting down by a half number setting. For example, go to 4.5 if you were at 5. 4. If your popcorn doesn't really pop up like you know it should, and you have too many unpopped kernels, then your knob setting was too low. Next time you pop, adjust your knob setting up by a half number setting. For example, go to 5.5 if you were at 5. 5. When using the Cold-start method, do not "pre-heat" the kettle and do not try to use the kernel test method to find out when your kettle is hot enough to pop. The temperature on your burner is ever rising when using the Cold-start method, so using the kernel test method will pop your popcorn at too-high temperatures, and the result will be tough to chew. Again, sometimes there is no silver-bullet to getting your temperature right the first time, so be patient. Don't be afraid to do steps 3 and 4 in 1/4 number increments instead of 1/2 number increments. You will find the best setting with time. Add them up: 9¢ + 22¢ + 5¢ = 36¢ per batch of popcorn made in the Whirley-Pop. $5.00 / 24 = 20.8¢ (I round up to 21¢ per bag). Hmm, that's pretty cheap...but wait. There is only 1/4 cup of popcorn in a microwave bag (you can check it on Pop Weaver's website where it shows the nutritional info). I beat the cheapest microwave popcorn known to man by almost THREE cents, and I would pay many times the cost for the perfect movie-theater popcorn taste that I get every pop! December 2011 Update: As things go, prices changed in the last month. In this case the coconut oil went up. So if I factor in a $4 increase in a gallon of coconut oil (was $21, is now $25) I get a total cost of 20¢ compared to 21¢ for microwave popcorn. I'm still cheaper. But I expect that as time goes on, prices will change again and I may not be able to make it cheaper than the cheapest microwave popcorn, but it should be comparable, and it will always be worth it! One more disclaimer. I always choose coconut oil and Flavacol that has free shipping on Amazon. That also helps keep the price low. Not so long ago, I used to believe this, and here's why I think I thought this: It all started back in the dark ages when, before microwaves and microwave popcorn, we all had oil poppers (Remember the black base that you plug in and the amber top/bowl?). If you were the average person, you would make popcorn in one of these with whatever oil you had in the kitchen and then add melted butter and salt. This was the best because it was all we knew how to buy, and it really did taste great. Then came the microwave and microwave popcorn. When we first tasted it, it was terrible. It didn't taste anything like the popcorn we knew how to make, and, it was expensive. So we stuck with our oil poppers. But somehow over time, the microwave popcorn scientists figured out that taste did matter, and they figured out a way to make the taste as good as or maybe even better than popcorn popped in vegetable or corn oil. The scientists also learned how to make the popcorn look yellow to simulate the butter look. With pretty good taste, good look, and great smell (well, it's really hard to make popcorn smell bad unless you burn it), the easiest popping method by far, and a very reasonable price, they succeeded in defining how most of us think popcorn should taste. But, is it the best? Of course this is a matter of opinion, but ask anyone who has ventured on their own to find their favorite popping oils and seasoning, and it is almost guaranteed that they will tell you that microwave popcorn is terrible when compared with conventional methods. One might be led to think that anyone defending the extra time and money spent to popcorn in a special way could cause somebody to attack microwave popcorn. This may be true, but, I can tell you from first hand experience that after I made this movie-theater popcorn and tasted it, I tasted the microwave popcorn that I had been eating for years and I could barely eat a couple of kernels of the cheap stuff before I couldn't stand it. There is no doubt in my mind that my movie-theater-popcorn is superior to any other "butter" flavored microwave popcorn, and, until thousands of movie theaters start microwaving their popcorn, you can rest assured that I am right. Nice work, just bought whirley popper. Your instructions are correct. This text looks like it took a while to make and I love reading about my passions! Thanks for the great post. I was about to give up on making movie style popcorn. My only question is, should the oil be in liquid form before cooking? If so, what should I do about a whole jar in solid form? First of all, I'd like to thank you for your fabulous write-up about your popcorn making technique. My brother and I, like you, over the past months have lately been doing all sorts of experiments on how to create the perfect batch of popcorn. Through research, as well as trial and error, we have discovered a lot the same information. We use an oil popper like this one: goo.gl/PpkKnj - and of course coconut oil with beta carotine, flavacol and supur kist II. While this is obviously far better than microwave popcorn, and more than adequate - there are two problems we have come across, that are preventing us from creating the perfect batch. First is the 'chewy' texture that you mention. Never before had I seen an in depth analysis of the effects of temperature on the popcorn texture. Though I always assumed it had an effect, I had thought for some reason that hotter was going to be better in creating a fluffier, more fully expanded popcorn. We've been preheating our 'cold-start' popper for a few minutes before putting the popcorn in. I'm trying to conceive of a good solution for temperature control, with a plug-in popper. I'm thinking of buying a thermometer like you mentioned, and un-plugging and re-plugging the popper to maintain ~470 degrees. The problem is that unplugging will make the popper stop spinning the kernels temporarily - and I'm worried that may have a negative effect. Is it worth switching to a Whirley Pop to avoid this? Another problem to keep in mind is yield - as we like to make a larger batch than a Whirley Pop seems to allow. The second problem is the flavor of our topping. As mentioned earlier - we use Supur Kist, but we have the non-trans-fat version. And while it does add a good flavor and texture to the popcorn, a proper comparison shows that it still doesn't taste very close to our local theater butter topping. Do you know if there is a significant difference in taste between the two versions? Or is it possible there is some other commercially available topping that has the taste we are looking for. @geekMachine: Great article, thanks for sharing your knowledge -- really appreciate that you had the stick-to-it-ivness to document as well do all that work. I offer an engineer's perspective on the temperature issue. There is a difference between the surface temperture of the popper and the inside of the kernels. The rate of heat transfer, Q, depends on the area of contact of the kernel, A, the difference between popper and popcorn interior, dT, and heat transfer coefficient, U. U varies with popper material, oil type, and kernel surface. For a given popper, oil, corn combination, U will be essentially constant. Your setting of the burner know determines Q, BTU/hr. dT = T (popper) - T (corn) = Tp - Tc . Tp - Tc = Q / U A. Finally, Tc = Tp - (Q/UA), i.e. the internal temperature of the kernel will be less than the temperature of the popper surface, and will depend on the burner setting, kind on oil, and size of kernel. The main thing you have control over is the burner setting, once you have chosen the popper, oil, and corn. By focusing on a popper temperature greater than the kernel temperature you selected the only directly measure able variable! With experimentation, you had the correct intuition and worked with a temperature that was high enough to produce the correct (unmeasureable) internal popcorn temperature. You discovered the first law of control theory -- you can only control what you can measure. You measured and controlled the main variable, Q (knob position). You also estimated the key parameters in the very complex heat transfer ratio, by using the infrared thermometer. Congratulations on a great piece of engineering! And thanks for your great write-up, which is often the most difficult part of the process! Great advice.. They make a fortune from selling popcorn! Wow, very informative!! Great job and a great lens! Great Job, I've never heard of coconut oil, very interesting, you sure do love your popcorn. @WhiteIsland: Excellent point. The Whirley-pop is not the end-all be-all stove top popcorn kettle. I chose it because it was the right combination of durability and price. @volusian: "...but to each his own." --- Amen. You were much more careful about reading Wikipedia than I was (or it was updated after I read it). As I read it, it was hard for me to pick out exactly how they measured or divined 356 degrees F.
As my wife can attest, I spent way too much quality time with the stove, my Whirly-pop, and different thermometers. One thing that I was able to reproduce quite consistently was that if I didn't get the surface temperature of the cooking surface, or specifically my baking thermometer or infrared thermometer, up to about 400 degrees, I would get no popping at all. You make a great point, which is that where you measure temperature, and perhaps more importantly, what all is in the kettle when popping corn, can affect the temperature that you actually want to shoot for. After I read the "Expansion and Yield" section of the Wikipedia article, I felt like I still just in the guessing phase of my work. Thanks for reminding all of us that this article is just a start to your popcorn journey! This is absolutely the most in-depth article I have read about popcorn â good stuff! Thanks for doing this. But I am somewhat confused about the temperature at which popcorn pops. You cite Wikipedia stating a temperature of 450 degrees F as the âpopping temperature.â This however, relates to a specific popcorn machine with a combination of ingredients that includes rendered butter. Below this in the âPopping Mechanismâ section of Wikipedia, it states 356 degrees F is the temperature at which a kernel of popcorn pops. I believe it is the latter as several other reputable sites state the same thing. Sites such as Yahoo, etc. seem to have propagated the 450 degree popping temperature which I believe is incorrect. Regardless, I think somewhere between 390 to 420 degrees F is the ideal temperature to cook popcorn, but to each his own. Fantastic lens, I love theater popcorn. My secret - The wife worked in the theater making the popcorn. It is clear we are talking to a popcorn scientist here. You have saved us all an inordinate amount of time and research! Love you lens completely. Who doesn't love MTP, if you like popcorn at all? I am putting a whirley pop on my wish list and bookmarking this for questions that will surely arise! So well done! Excellent lens interesting. Useful and informative. What a comprehensive lens about making theater popcorn! Now I can already smell the popcorn. Fabulous lens! Microwave popcorn tastes like styrofoam. Very thorough... Now I want popcorn! This is great. I always wonder why movie theater popcorn taste different then ordinary popcorn. Who doesn't like movie popcorn, it's great! I will restart my home pop corn adventures after this read. great article. Wow, great review. My husband loves movie theater popcorn, so I plan to try the Flavacol. @anonymous: 1/3 cup popcorn to 4 Tb sugar and 4 Tb oil. I use a whirly pop to cook it, but it is the best. Sprinkle with salt when fresh out of the popper. Tastes like the county fair. Wow, what a great article! I've been looking for useful information for quite a while, and I finally found it. Thanks for taking the time to perfect this craft and share the knowledge with us, kernel burners. Care to share any recipes for sweet Kettle Corn you'd find at a Fair or festival? Thanks! That is some seriously in depth popcorn analysis. The perfect popcorn temp was very interesting. Loved the article, it explains a lot about the critical nature of the proper temperature range. Gold Medal who has been around a long time too uses 445Â° &amp; 450Â° thermostats for their kettles with a high limit safety stat at 525Â°. I would think anything as hot as 600Â° on the Redenbacher Stiring popper would cause flash fires for any type of oil you would use. Your thoughts? Great point about steam and condensation on the lid. I've never thought of it like that, and as you make me think I know that there at least enough steam effect that I always let my popcorn cool/dry a bit before eating. If you eat it right after popping, when it's very hot, it's not as crispy. So I fluff my popcorn a bit. Fluffing is now an integral part of my process. But, with all my experiments on several poppers, I've not noticed more or less steam venting affect the final outcome. Still, I'm not totally sure and your right to question. Thanks for sharing your chewy popcorn hypothesis (ha ha, I know I'm talking to a fellow nerd when they say "hypothesis" instead of "theory"). It is very interesting and could lead to further popcorn enlightenment. @anonymous: You're experience is like gold! Real butter = Fake butter, ha ha! Thank you so much for sharing. It reminds me of a YouTube video I watched early in my popcorn journey titled something like Perfect Movie Theater Popcorn. I was jazzed to find it but all it showed was them adding a ton of butter to popcorn popped in vegetable oil. Talk about disappointment! And you comment about canola Vs. coconut oil, well, let's just say that there is "healthy popcorn" and there is true movie theater popcorn :) But in seriousness you comment is valuable because others may discover that they like canola oil just as much, and live approximately 2.13 hours longer. Dang it, I just can't help myself. Thanks again for a great comment! @anonymous: Hmm, you're right. There are 2 challenges when fighting the Movie-Theater-Man: 1. Finding the awesome ingredients at all, and 2: Finding them in home-kitchen-sized containers for a reasonable price. First, let me assure you that if you eat popcorn regularly, perhaps 2 times a week, you will have no trouble using the the quart of Flavacol in about 6-9 months, and it keeps fine. I believe it's about the same for O'dells Supur Kist II. These are bulk items made for concessions and so it is economical. Sorry that I'm not much help for the smaller items. They are out there on Amazon, but they just aren't economical. But I also haven't looked elsewhere. I have Amazon tunnel vision. @anonymous: Thank you for posting this. I admit that I'm a bit down on poppers that take temperature control away from me. However, you, and I'm sure thousands (millions?) more like you have enjoyed amazing popcorn without having to worry about a thing, all thanks to Presto and so many other manufacturers. Your point is important because others may rather keep it simple, and a Presto popper may be just the thing. Think of this page as the back-up plan for for any that run into chewy popcorn caused by too-hot poppers! Awesome lens. Makes me want some popcorn right now! I have a presto popper, and my popcorn turns out excellently and everyone I've given the product to agrees. EXACTLY like movie theater popcorn. You may have had a defective one. Excellent article, this is by far the best one I've found yet as to how to make great tasting theater style popcorn, thank you very much! My question is this, is the only difference between coconut oil and coconut oil with beta carotene the fact that the oil with the beta carotene makes some of the popcorn yellow? Also, have you experimented with adding flavacol after popping it, vs adding it beforehand, or do you add a little after it's popped too? What a great lens! I love popcorn and movies...Awesome! This is nice and all but everywhere I looked I only saw huge packages of Flavacol and O'Dells Popcorn Supur-Kist Topping (1 gallon size) mostly for commercial use. Is there some place where I can buy a smaller quantity of Flavacol and O'Dells Popcorn Supur-Kist Topping? @anonymous: For starters, go tell your wife how amazing she is for buying you the best Christmas gift ever! As much as it pains me to say it, eating MTP everyday might not be the healthiest thing to do. I guess it depends on how much we eat, but I like to look at the positives. Popcorn has fiber, .and it has carbohydrates that we all need to sustain life. It is âwhole grainâ too. Ok Iâm just jivinâ you. When I first heard of Flavacol, the chemical sounding name by itself was a dead giveaway that I did not want to know what was in it. If it were good for you, Gold Medal would have named it âAll Natural Healthful Blend of Farm-Grown Free-Range Vitamin F.â Ok, Iâm getting carried away with sarcasm. Iâm sorry. Itâs clear to me that between the coconut oil, sodium, and yes the yellow #5 and #6 and the diacetyl (artificial butter flavoring), I need to practice a little moderation, emphasis on little. But your question goes much deeper than is Flavacol bad to eat everyday. You want to know if there are other ways to get MTP flavor without the artificial additives. Youâve stumped me, I donât know. However, Iâve seen interweb pages and youtube videos that explain how to make ârealâ MTP with only real butter. I know this isnât possible, but for those folks, they donât know the difference. What Iâm trying to say is that somewhere out there there is a healthier alternative that wonât taste exactly like MTP, but that will still taste great to you. If you happen to find the healthy twin brother of MTP, please let me know, and thanks for a great question! Fan-freakin-tastic instructions you got there!!! I worked at a movie theatre for 18+ years, and you seem to have gotten everything right! I guess I never thought about replicating the exact formula at home, I think I will be off to Amazon after this post! I have worked with 2 different kinds of popping oil, coconut and canola. After your description that coconut oil hardens at lower temperatures, I think that means that I used coconut oil waay back when, and many theatres switched over to canola oil, partly because it's supposed to be a little healthier, and because it doesn't solidfy it makes it easier to work with. (With the coconut oil in 5? gallon containers we had a "heat stick" to melt the oil enough each day to be able to use it!) Some may disagree, but I didn't find a taste difference, at least it didn't stop me from eating popcorn every day!! And that goes to the comment, if you eat it all the time, does it lessen the experience? 5 or 6 days a week for 18 years leads me to believe the answer is NO!! :-) And lastly, a quick funny story about the butter "topping". The first theatre I worked at was in a very earthy crunchy kind of area. We got tons of complaints about the fake butter. We decided to switch to real butter, and wouldn't you know it, we got MORE complaints about that!! Most people thought it was spoiled. Well, sorry for the book here, guess I put in more than my 2 cents, maybe 6? 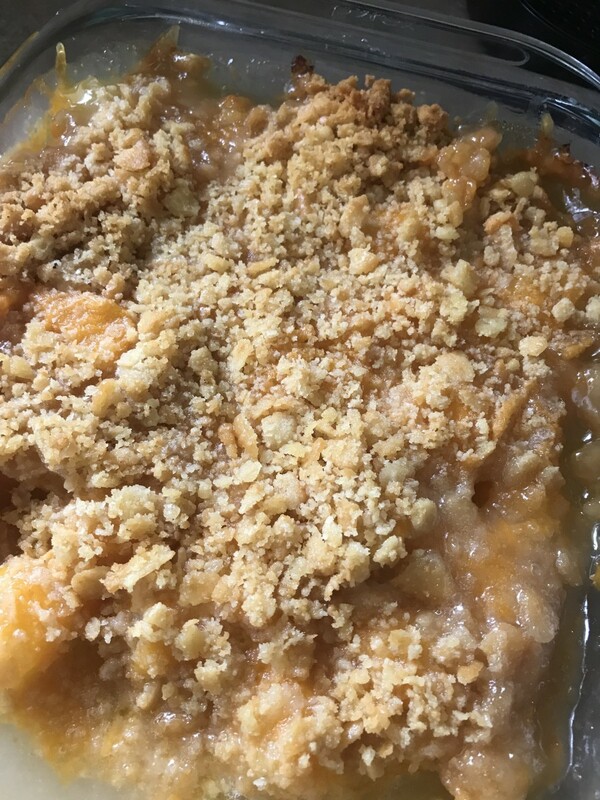 @geekMachine: I have a Nordic Ware popper, it does work fine without oil (a desirable feature for many), but would like to try it with coconut oil. You are correct -- the plastic is quite different and seeming indestructible by heat. They also make a microwave bacon cooker made out of the same material. I have been experimenting with stove top popping and found your epic article. I'm not completely convinced that steam is not an issue (if only because it condenses on the lid and makes wetness), but agree that temperature is key. My first batch was both chewy (portions of kernals unpopped) AND scorched. My hypothesis is that the chewy kernals result when the corn seeds are not uniformly heated. High temperatures (and even worse, throwing cold kernals into hot oil) results in the outer layer of the kernel heating enough to pop the hull, but leaving a colder inner layer of corn that doesn't pop properly. I started with cold oil, corn popcorn, and heated slowly, apparently passing through the 475 degree zone, popping almost every kernel to perfection. Enjoy your scientific approach and excellent writing. My wife got me a WhirleyPop for Christmas and I've been eating popcorn EVERYday! My only concern is that consuming this much popcorn, I decided to look up the ingredients in Flavacol (check wikipedia for: Tartrazine, Sunset Yellow FCF, and Artificial butter flavoring ). The fact that the artificial colorings are banned in some countries, not to mention concerns about the artificial butter flavoring, really does concern me. Any tips for making MTP without the flavacol? @anonymous: You made a great observation about the coconut oil in that video. Is it orange, or is it red? When it is a solid (below 76 degrees F), it is orange. When it is a liquid (76 degrees F and above) it is red, or at least reddish. Before taking the video, I removed some of the coconut oil from the jug when it was an orange solid, and I microwaved it for a few seconds until it was a red liquid so that I could more easily measure it. In the end, it will always turn your popcorn buttery yellow, like magic. You spoke of making your own kits. Great idea! I've though of doing this, but I too don't know what happens when popcorn kernels sit in oil for very long. Kits that can be bought on Amazon keep the popcorn separate from the oil. Search for popcorn kits on Amazon or Google images and you'll see how they do it. All this means is that popcorn kit makers choose not to mix oil and popcorn for storage. But what about microwave popcorn? They do mix them. Can they get away with it because they add preservatives or use a special oil? Can they get away with it because the oil stays solidified? I'm not sure. In general, coconut oil will remain safe to eat for at least 1 year when stored in an air-tight container. It will often last much longer than that, perhaps up to 4 years or more. From that standpoint, you're pretty safe storing coconut oil either in the jug you bought it in, or in a Ziplock bag, as long as it's air-tight. If you try the experiment and store popcorn in coconut oil for a while, I'd love to hear back on your results! Thanks for reading! @anonymous: Wow! I hadn't thought specifically about the psychology of MTP until your brilliant question. Will it lose a bit of that magic? It would be so sad to buy popcorn at the theater and eat it while Maverick and Goose sing "You've lost that lovin' feeling" inside your head. But maybe it would be like the Terminator and the amazing flavor will always tell you, "I'll be back" no matter how often it explodes in your taste buds. To be sure, your popcorn world will be turned upside down, or at least sideways, so how can you know before starting your the MTP journey that you won't lose a piece of your popcorn soul along the way? If thereâs one thing I've learned from Disney, it's that you must "Follow Your Heart!" 1. Not all MTP is created equal. Blaspheme you say. While itâs true that coconut oil and Flavacol is the standard, and that Polyjuice potion may only have one working recipe, for every theater there is a unique popcorn potion hair. One of these hairs is - Extra butter - If you get extra butter at the theater, and you stick only to the Flavacol and coconut oil at home, then popcorn at the theater will still have some extra magic, like Christian Bale in the Prestige. Another hair is - Popcorn texture - People think Iâm crazy, but I can tell with each batch of popcorn whether the texture is perfect, or not. Most popcorn machines at theaters produce perfect texture all the time, and if you are a texture person, you might not be able to reproduce perfect texture at home without a lot of practice. Texture is of course a subjective assessment, and the theater often defines what we think of as âperfect textureâ. In this case the theater guarantees the extra magic, like Willie Wonkaâs factory. Another important hair in the potion is - Aroma - Think of it like this: If the popcorn aroma you create at home is like the splash from the cannon ball kid in The Sandlot, the aroma at the movie theater is like the Tsunami from the asteroid in Deep Impact. Part of the reason is at home you are right there while making the popcorn. You canât smell it because of the frog in the slowly heated pot of water effect, but when visitors enter your house they can really smell it. But even then, the theater smell is incredibly stronger because it has huge popcorn machines that have fans blowing the amazing smell so that the smell is embedded in the carpet, the walls, the seats, and even in the hair follicles of the acne ridden teenager behind the counter. If itâs the smell, theater popcorn will always have that extra magic. Finally, one subtle hair is - Popcorn Cooked-ness - I know this sounds strange, but depending on how long popcorn sits in the kettle before popping, the hull is cooked more or less, kind of like Anakin in episode III. When cooked more, the hull is darker, and gives the popcorn more flavor (come to the darkside of the force). When cooked less, the hull is lighter and the popcorn is fine, just not with quite so much flavor. Again, hull flavor is a subjective quality, but if your theater has a machine that cooks the popcorn just the way you like it, youâll only have the magic there until you can reproduce it at home through trial and error. 2. Theater popcorn is effortless. When I buy popcorn at theater, I feel like the guy on Limitless because excellence comes so easily. But at home it is like Groundhog day, where I make popcorn over and over and over again and results are improved through trial and error. This gives popcorn at the theater extra magic, the same way going out for dinner is magical even if you can make wonderful dinners at home. Along the same line of reasoning, because it does actually take effort to make popcorn at home, I do not make it all the time. With great popcorn power comes great responsibility but even Spiderman gets lazy once in a while when he turns into alien Spiderman, and so do I. The truth is that even though I can make it anytime, I donât make it all the time, and so there is still a chance that the theater smell could overwhelm me into buying a bag. 3. Flavacol is so, so good. Believe it or not, there are those who love flavacol so much that they will savor it straight, just to get a fix. I could say that I have a friend who does this but you would see right through me. Sadly, salt is not very good for you in large quantities, and Iâve noticed that some theaters are holding back on the salt, or Flavacol if they use it. Because I use more Flavacol, I have discovered that my popcorn is even more like MTP than it is at many theaters! In this case, yes, the magic of popcorn at the theater is lost, but thatâs not my fault. Iâm only recreating at home how it should be at the theater, so I do not feel a loss, but more like Gandolf restoring the rightful king to middle earth. 4. Everyone has their own high-class popcorn limit. Some can hardly get enough of the highest class, like Mr. Collins with Lady DeBerg. However, others may fast tire of best, like Jane with Mr. Darcy. But even Jane came around in the end, and I wonder if that is how it could be for you with high class popcorn at home, and at the theater. 5. You can sneak your MTP into the movie theater. 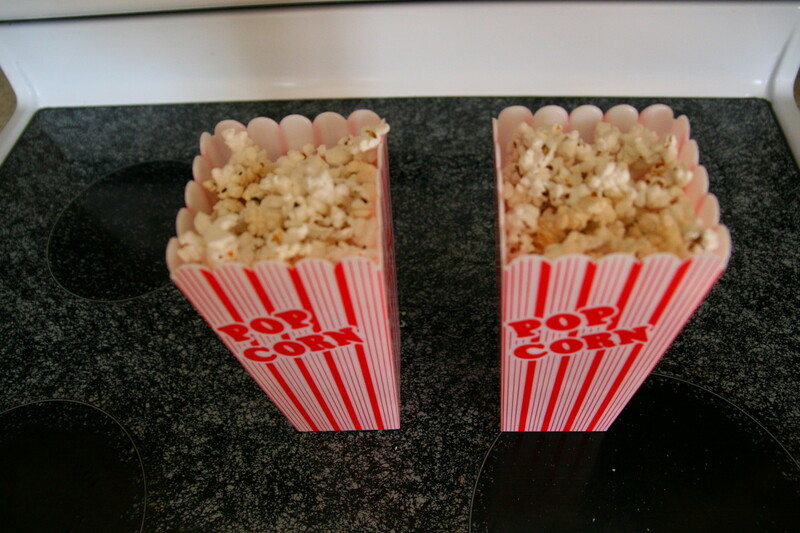 Letâs say that you ultimately think that your MTP and the popcorn at the theater taste exactly the same. Instead of worrying about losing the magic, wouldnât you would feel like Plankton discovering Mr. Crabs secret Crabby Patty recipe, or the genie in Aladdin: Phenomenal cosmic powers (in an) itty-bitty popcorn box? The magic will be even magikier because you are paying so much less money for MTP, and for me that is better than 3 wishes. Iâm sure that this has been no help whatsoever, like Jar Jar to a Star Wars movie, but at least I had fun writing it, and I hope you enjoy MTP no matter how you get it! Remember, Han shot first! I absolutely loved this article..I read every single word and I was entranced! But I have a question for you... I look at Movie Theatre popcorn as being a treat..because I could only get it at the movies, something really special. Now that you can make it at home whenever you want, does it lose a little bit of that magic? @ron-pevey-7: Great tip! Flavacol is potent, which is why it is so, so good. You and I couldn't agree more on the combo: Popcorn and Coca-cola. So good! 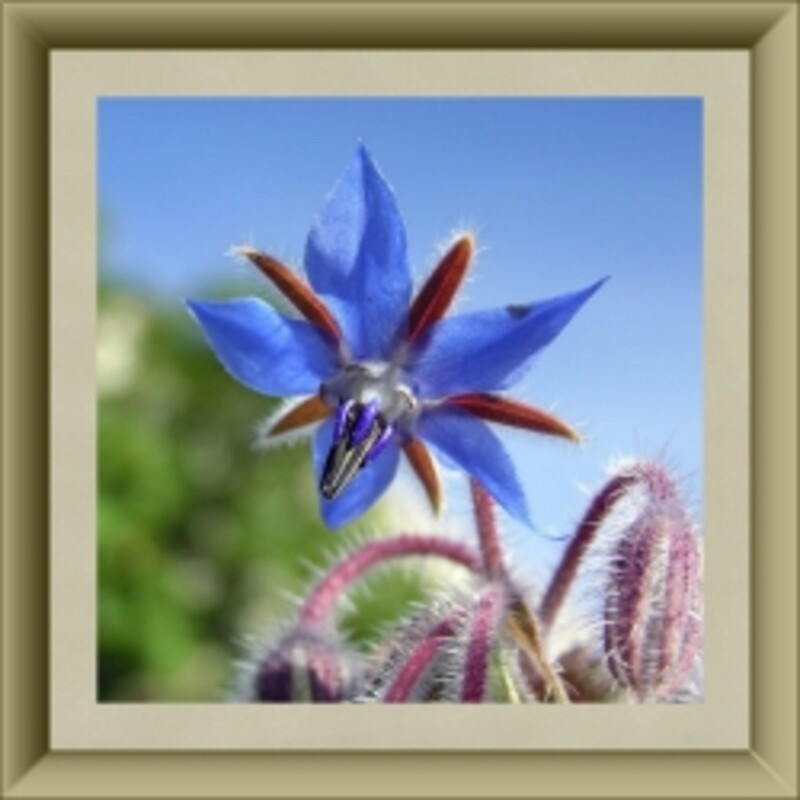 @paul-clark-716970: Thanks for your comment! Re-heating popcorn in the oven is a technique I've read about a few times on the interwebs. I tried it during my "dark ages" of chewy popcorn with my Whirley Pop. I didn't get good results, but I only tried once, so I can't claim perfect knowledge on the subject. However, I decided after my first and only oven re-heating, that if I couldn't enjoy perfectly textured popcorn immediately after popping, then it wasn't worth it (I know, Blaspheme). Furthermore, I reasoned that I had enjoyed perfectly textured popcorn immediately after being popped from a friends popcorn machine, and so I must have been doing something wrong with my Whirley Pop, which I later discovered was using too high a stove setting. You can get perfect texture from your Whirley Pop through trial and error until the perfect stove setting is found. If your popcorn is too chewy, turn your stove temperature down a bit. By so doing, it will take longer for the popcorn to pop, but the temperature will rise more slowly, thus getting more popcorn popped within the ideal popping temperature range. Regarding the heat lamp inside of popcorn machines, I discovered that what really keeps popcorn warm is the heating element found underneath the floor of every single popcorn machine. The heat lamp is largely for show, in my opinion. So, it turns out that your oven re-heating method is very similar to how a popcorn machine works. Who knew? But, I don't think re-heating works. In another popcorn machine, this one I own, it only pops, you guessed it, tough/chewy popcorn (there's $600 down the drain!). I had hoped that leaving the chewy popcorn in the machine for hours with the heat lamp/floor heating element turned on would ultimately make the popcorn nice and crispy, but no luck. But who knows, I've been wrong before and maybe your tip helps others! Thanks for sharing! The chances are, your air popper is getting too hot, too fast. I agree that it's likely your first batch was less tough/chewy than your second batch. 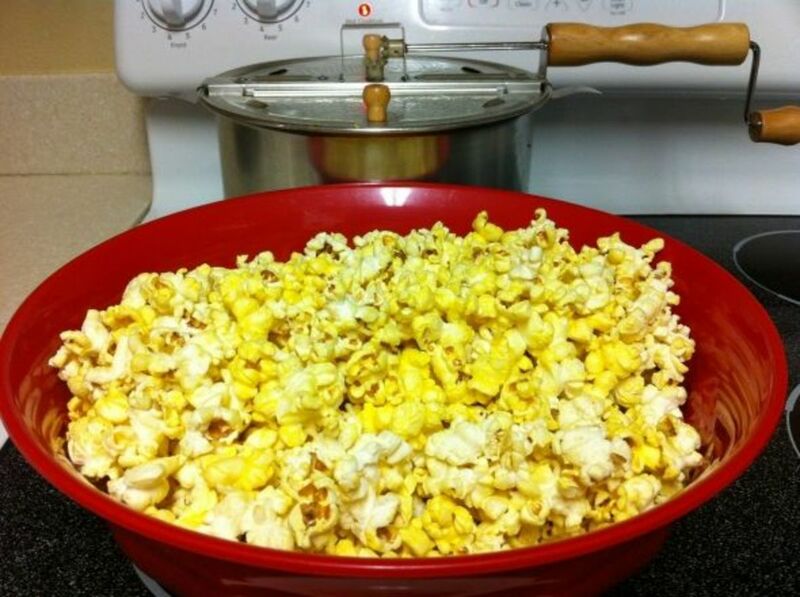 A pre-heated popper will push through the ideal popping temperature faster, and pop more of your popcorn too hot. I'm not saying all air poppers have this problem, but without a way for you control the temperature, you are at the mercy of Presto's design, testing, and manufacturing process. Because you were gifted an air popper, I wonder if you might prefer the Nordic Ware microwave popper? With the Whirley Pop, you must use oil, but with the Nordic Ware, oil is optional. Either way, you can't go wrong, but there often is more trial and error with the Whirley Pop, and if you don't want oil, then your decision is easier. ...and the Nordic Ware offers the magic and ease of microwave popping. I don't understand why, yet, but for some reason the microwave does a good job of not getting the popcorn too hot too fast, and the results are good and easy. Regarding refrigeration, I don't know. If you try the experiment, I'd love to hear your results. Here's my guess at what will happen: The popcorn starts cooler from refrigeration and thus the air popper will need to heat up even hotter to start popping the popcorn. 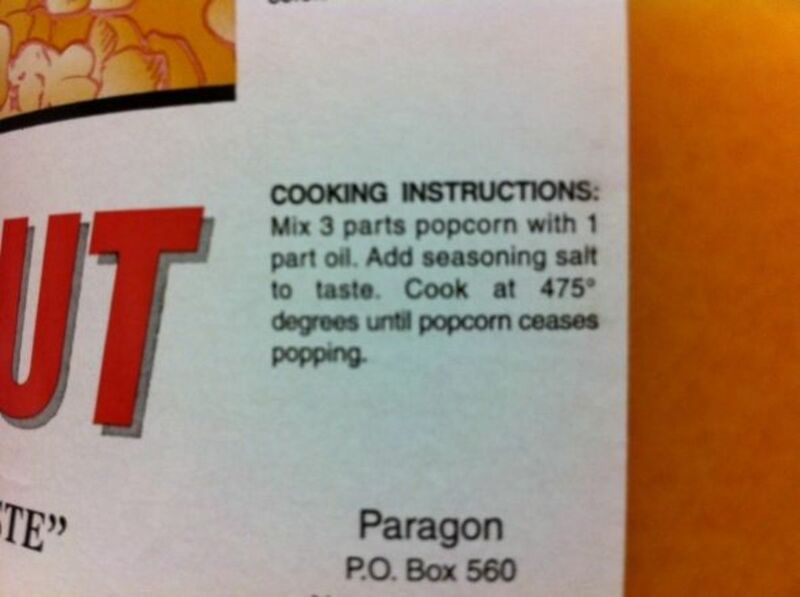 This will shorten the time that the popcorn temperature is near 450 degrees. In other words, by the time the popcorn is ready to pop at 450 degrees, the temperature of your popper is way beyond 450 degrees and will push the temperature of the popcorn higher faster. I tend to guess a bit, so it would be great to see what happens! Thanks! I found your article very informative. I love popcorn and have been eating the unhealthy microwave stuff. My family got me a Presto airpopper for Christmas and now I see the Whirley-Pop was probably a better choice. I made popcorn with it for the first time last night and it was chewy. But instead of saying, "Gee, thanks, but will you buy me a different popper?" I'm wondering what you think about keeping the popcorn in the refrigerator and if that will help reduce chewy popcorn. I made two batches, one right after the other, and I gave the kids the first batch. It may not have been chewy as it was more of a "cold start." But the second batch was definitely chewy and I ended up throwing it away. Thanks again for the informative article. Would love to know what you think about storing it in the refrigerator. @anonymous: Yours is a very important question to clarify. The first thing I thought when I researched the Nordic Ware popper was, it will melt because it is plastic. I've seen very hot oil melt plastic before. The wording in the Amazon listing is unclear because it promotes the popper on the merit of not needing oil. I still have the packaging from my popper and on it are instructions which give specific instructions on how much oil to use. My experience may count for something too and I have not seen damage to the bowl yet, and I most definitely use coconut oil. I think the type of plastic is much different than what I normally use for food storage. The Nordic Ware popper is very hard plastic, and for whatever reason, very heat resistant. WOW what fabulous info!!! I have a question tho...Am planning to go the lazy microwave way &amp; I see Nordic Ware says do NOT add oil. Might it damage the popper? I suppose not or it wouldn't be recommended as an option, but thought I'd make sure before i buy Nordic Ware instead of WhirlyPop. Loves me some homemade theater corn yeah!!! I'll need to return here probably next time I'm making pop corn! Great work!! Very informative. Many thanks. I will be trying some of you techniques and recommendations. One additional condition to consider is the heat lamp used in the theater poppers. I expect it keeps the popcorn warm/hot and prevents it from absorbing moisture. After I pop my popcorn (Whirley popper, cold start method, always chewy) I put it in a large metal bowl and put it in the oven at 200 to 225 deg for 30 minutes to an hour. Longer is ok too. 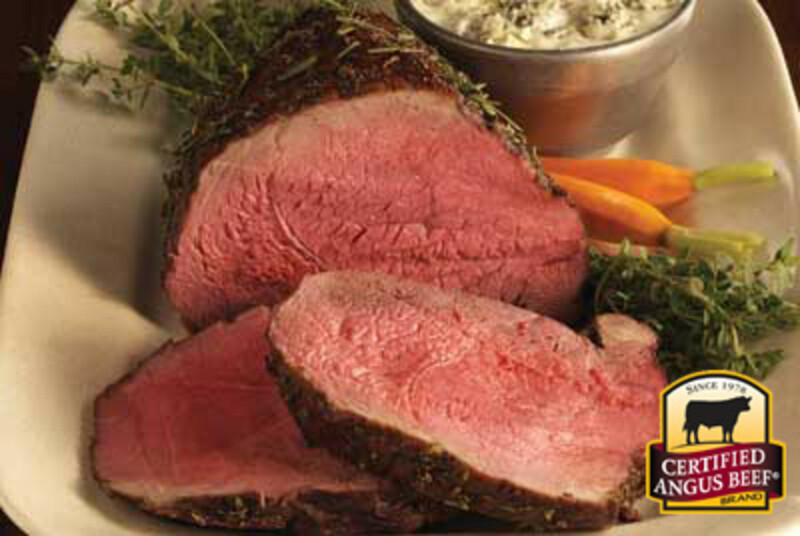 This drives off the moisture and makes it crispy and crunchy. This technique is also magic for tortilla chips and especially taco shells. This is right on the money in case there are any doubters out there. @jhorneker: Thanks for reading. It would be great if you could report your results. There is always room for more understanding/better ideas. After throwing out another bad batch of chewy popcorn, I thought I would do a google search, and I FOUND YOU! What an article! Super great, and you addressed all the things I had asked myself. The tip on get the infrared thermometer is great and also aiming it at a black, non-stick pan to find the right setting. I will order one of these and give it a try! Thanks! I miss my popcorn! Don't let anyone tell you this receipe doesn't work. IT DOES. I tried it on my industrial popcorn maker and it worked perfectly. Don't add more popcorn though than listed. It won't have that rich flavor and will end up more white than yellow. Great List, II feel like an Expert @ Popcorn Making, I usually href="http://www.uptownpopcorn.com/"&gt;Gourmet Popcorn but love this info!! @anonymous: Thank you! It really is a labor of love. Reading your lens is like getting Phd in popcorn.This lens is just amazing. @Close2Art LM: Thanks! I didn't know either and I almost gave up when my popcorn didn't turn out like I wanted. 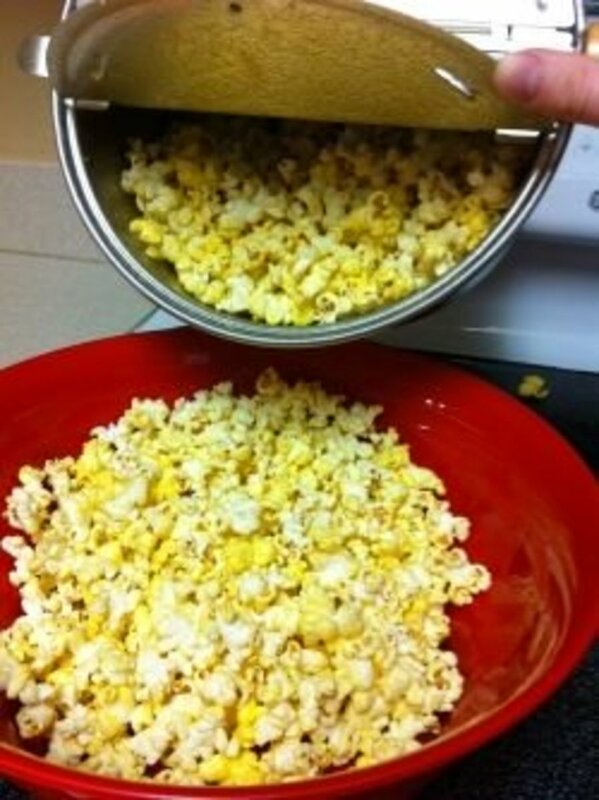 I hope this helps other to make perfect popcorn every time. The great news is that once you have your method down, it's easy to make!